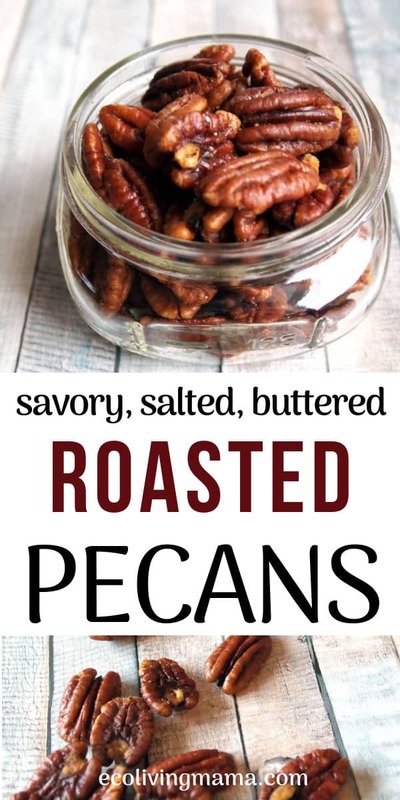 Savory roasted pecans are rich, buttery, slightly smoky and oh-so-addictive! My take on roasted buttered pecans includes 2 of my all time favorite spices – smoked sea salt and smoked Spanish paprika. This roasted pecans recipe is so easy to pull together – it only has 4 ingredients and can be in the oven roasting away in just 5 minutes. 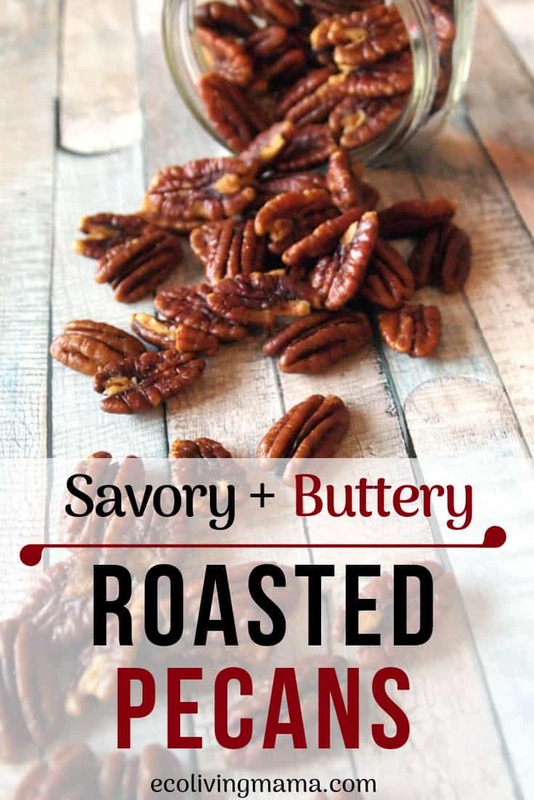 Savory roasted pecans are perfect for gift giving (think hostess gifts, gifts for neighbors, or for anyone who has taste buds) and make a tasty addition to any appetizer table. These pecans are so delicious, you should probably make a double batch because you’re going to want to keep some (or a lot) for yourself. Seriously, make a bunch, because before you know it, there will be just a handful left and your family will be asking for more. My 4 year old has been devouring roasted buttered pecans for the last 4 days, and I’m happy to indulge him! Pecans are full of healthy fats, antioxidants and are anti-inflammatory, so I’ll happily feed them to my family on the regular. Plus this savory roasted version is coated with butter, and you just can’t beat that in my book (apparently my 4 year old agrees). This roasted pecans recipe uses 2 ingredients many people may not have in their kitchens, so I want to spend just a moment talking about them. Smoked Sea Salt and Smoked Spanish Paprika give these buttered pecans a subtly smoky and deeply savory flavor (whoa, what a tongue twister that is!). If you are already familiar with these 2 wonderful spices, then please feel free to skip ahead to the recipe! Otherwise, please prepare to learn about 2 wonderful additions to your spice cabinet you didn’t know you needed. If you have never tried smoked sea salt before, NOW is the time my friend! I am obsessed with smoked sea salt, and use it multiple times a week in lots of different ways. I especially love smoked sea salt on roasted veggies of all types (sweet potatoes, brussel sprouts and broccoli are favorites) and pretty much any meat. The smoked sea salt I am loving right now is Alderwood Smoked from San Francisco Salt Co. I buy it in a 2 pound bag (I told you I’m obsessed! ), but if you’re just dipping your toes in to the world of smoked salt then go with a smaller container. I’ve also found some nice varieties of smokey salt in bulk sections at specialty grocery stores like Central Market. For this recipe and for most of my cooking, I use Sweet Smoked Paprika, and I seek out the Spanish variety. Smoked paprika is, in my opinion, an underutilized spice! Don’t worry, I’m making up for it by using smoked paprika in EVERYTHING. I have a serious love affair with smoked paprika, but it needs to be good quality. This is a spice I skip the grocery store version of and buy online. I tried out a new (to me) smoked Spanish paprika for this recipe and I love it. 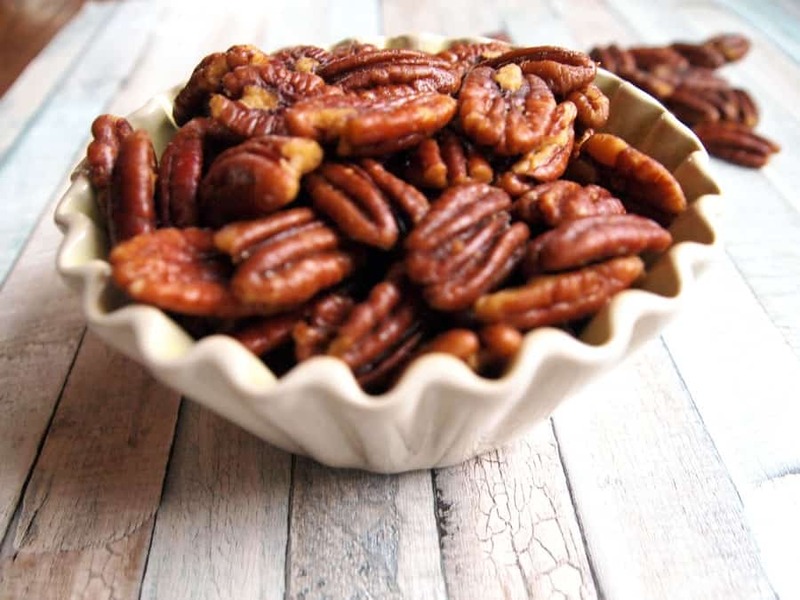 These savory roasted pecans are rich, buttery, slightly smoky and oh-so-addictive! Bake for a total of 1 hour, stirring after the first 30 minutes, then again at the 45 minute mark. Once cooled store in an airtight container. Those sound delicious!! We always make sweet roasted almonds, but I’d love to try this savory recipe next. Thanks so much for sharing!! They are so buttery and delicious – I bet you will love them!